Learning to Print Excel worksheets and exiting from Excel is covered in our beginner Excel spreadsheeting course. You may want to print your worksheet when you’ve finished working with it. This will give you a hard copy of your data to look over and to share with others. Best of all, you can get a quick printout of the active worksheet very easily. Click the FILE button and choose the Print button. In the following exercise, you will print a worksheet. Click the FILE button and choose the Print button. [The PRINT dialog box appears]. Closing a workbook removes it from your screen but leaves you in Excel so that you can keep working. Before you close a workbook, you should make sure that you’ve saved your work. If you’ve forgotten, however, Excel reminds you that you need to save the document and gives you a chance to do so. You can exit from Excel after you have saved and closed any open workbooks. Click the workbook Window Close button. Click the FILE button and choose Close. Save the file if prompted. Click the application Close button. 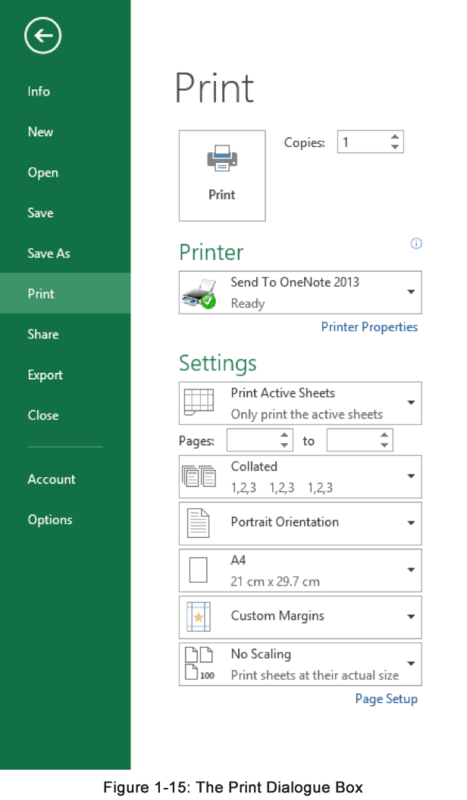 Click the FILE button and click the Exit Excel button (bottom right). 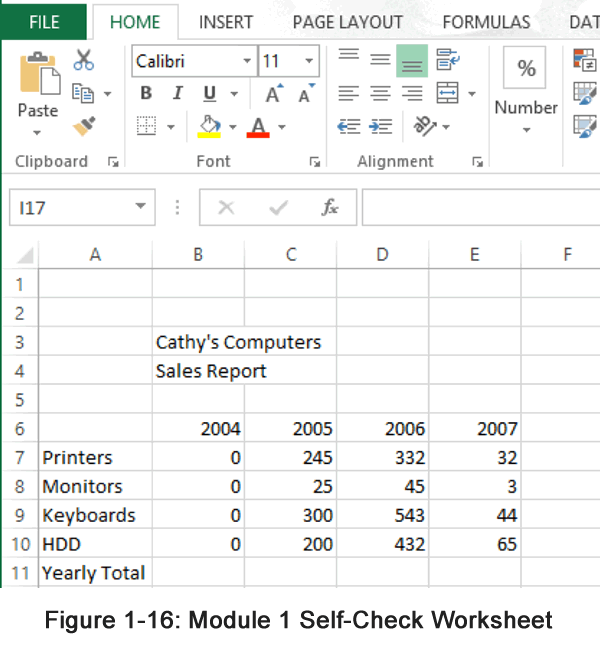 In the following exercise, you will close the Orchard Report Draft workbook and exit Excel. Click the workbook Window Close button. [Save As appears]. If a message appears asking you if you would like to save the changes to the workbook file, choose Yes. [The workbook closes]. Click the application Close button. [Excel closes]. Select cell C3 with the keyboard. In cell C3, enter Cathy’s Computers. In cell C4, enter Sales Report. Using the keyboard, select the range B6:E6. Using Figure 1-11 as a guide, enter the years in the range B6:E6. Use the mouse to select the range A7:A10. Using Figure 1-11 as a guide, enter the product names into the range A7:A10. Enter zeros in the range B7 through B10. Using a range, enter the data for 2007, 2008, 2009 and 2013. Adjust the width of column A so you can read the text clearly. Select the nonadjacent cell ranges B6:E6 and A7:A10. Save the worksheet in the Data folder on the C: drive as Cathy’s Computers. Save cells A1:E10 in the Data folder as an HTML document (with no title or header) with the name Cathy.htm. In cell A11, enter Yearly Total. Use Save As to save the workbook again. Use the file name Cathy’s Computers Draft. Close the workbook, and then exit Excel. The best way to learn Microsoft Excel? We hope you found this online tutorial useful? The best and most effective way to learn Excel is however to join a face-to-face instructor-led class. We run Excel classes in Chicago and Los Angeles throughout the year or we can send an instructor to deliver onsite Excel training at your offices. View our Excel training testimonials.